Colorado’s oil and gas economy poised to propel forward — Wolf Resources, LLC. 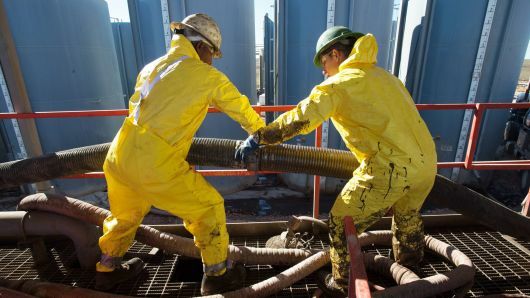 Ken Cedeno | Corbis | Getty Images Workers connecting tubes on the Raven Oil Drilling rig near Watford City N.D.
Like other High Plains states, Colorado’s oil and gas economy is in a position to help propel it forward. As The Denver Post reports, oil prices rose after recent OPEC production cuts and are now high enough to motivate producers to put more rigs to work and translate into more domestic production, said Erica Bowman, chief economist with the American Petroleum Institute. Colorado has 26 drilling rigs running in the state, compared to a low of 15 rigs working in May and the 76 operating in fall 2014. While that may seem like a big gap, today’s rigs are much more productive than those operating years ago, according to EnerCom, a Denver-based energy consultant. The Permian Basin of southwest Texas is an example, as rigs there are pulling up 3.4 times what rigs in 2014 did, EnerCom estimates. More rigs and more drilling should translate into more hiring. But petroleum firms will face a much tighter labor market than was the case in 2012 and 2013, especially in Weld County, Colorado, the epicenter of drilling activity in the state. Weld County’s unemployment rate in December was 2.6 percent, the lowest since 2000, according to the U.S. Bureau of Labor Statistics, in contrast to the 8.7 percent unemployment rate at the beginning of 2013. If those firms do start to make a big hiring push, they will likely pull workers from construction and manufacturing, creating disruptions in those industries but there is also a sense that many firms took a hit to the bottom line and retained workers so they could be ready for a recovery. A lot of things could cause the oil and gas recovery to fail. One issue producers are watching closely are trade relations under the Trump administration, particularly changes to the North American Free Trade Agreement with Mexico and Canada. Another trend to watch is how utilities respond to higher natural gas prices and whether they switch back to coal as a fuel source for electricity generation. U.S. coal production last year suffered an 18 percent decline, reaching its lowest levels since 1978, according to the Energy Information Administration, which predicts coal production will rise 3 percent this year on higher demand from power plants. Colorado, despite adding large amounts of renewable energy generation, remains highly dependent on coal as a power source.